“It is encouraging that AC35 participants are consistently showing a deep appreciation of the beauty of Bermuda and her people,” BEST said following the news that the six teams in the America’s Cup signed a Sustainability Charter focused on environmental responsibility. A statement from the group said, “America’s Cup Event Authority [ACEA] along with six America’s cup teams have signed on to an Environmental Responsibility Plan, the “AC35 Sustainability Charter”, that will protect Bermuda’s marine environment during AC events and set a protective stewardship tone for future maritime events. 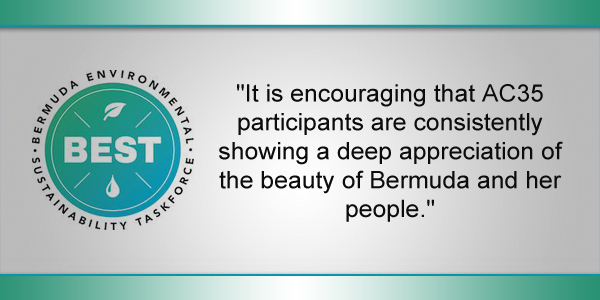 “The Bermuda Environmental Sustainability Taskforce [BEST] has been encouraged that at the earliest opportunity, over a year ago, AC35 Chair Mike Winfield and Minister Grant Gibbons made statements in strong support of environmental awareness and protection. “We noted at the time that the previous America’s Cup [AC34] held in San Francisco adhered to very high environmental standards. “In the absence of equally stringent environmental standards in Bermuda, we are delighted that this world class event, AC35, is bringing these sustainable event-management benchmarks to Bermuda. “It is encouraging that AC35 participants are consistently showing a deep appreciation of the beauty of Bermuda and her people. “We see tremendous value for Bermuda from our AC35 guests who have been participating in so many aspects of our community services, including environmental issues such as KBB cleanups and Lion Fish eradication. “We understand that the AC sailing teams are leading the way as signatories to the ten points of the Sustainability Charter. Maintenance teams, the Endeavour Programme and the youth sailors-in-training are also adopting the plan. This is great I hope that we all can become just a bit more aware of how important our environment is. Little sacrifices can make a huge difference! I don,t think there was a need to sign a charter, if Bermuda is hosting an event than it needs to ensure that all parties to such a huge event understand their role to the enviroment. Everywhere in the world where thousands upon thousands of persons gather, security, sanitation, transport, customs clearance, immmigration, banking, housing, medical, food vendors, etc. are all looked at and planned for. Costs for such services are factored in. Americas Cup is not the average citizen,s form of recreation on a sunday afternoon. A lot will be said leading up to and shortly after its completion. We are asked to brace for more than a thousand, um not sure of the anticipated number of visitors, it could be 4 or 5 thousand. We simply need to encourage folk, and be thank-ful. and of course spread the goodwill.